Don't just give random flowers to your mom as a Mother's Day gift. Why don't you make things more special and meaningful by giving her artificial flowers with apt symbolism? Want to give flowers to your mom for Mother's Day? Well, that's not surprising since this is practically tradition, isn't it, much like how one would want to give their lovers bouquets of red roses for Valentine's Day? Absolutely nothing wrong with that whatsoever. But why should you consider giving your mom artificial or fake flowers as opposed to real and fresh flowers? And what kinds of flowers can you give to your mom that are actually appropriate and fitting for the holiday in question? So, what's wrong with giving real and fresh flowers? Nothing, really. It's your choice, after all. But what reason do you have for considering getting artificial flowers instead? The main reason is the difference between these two. They wither and wilt and fade and die sooner or later. They won't last. But artificial flowers will because they're not real. These look real, right? Well, they're actually fake flowers. Who would have thought? Several days after Mother's Day, these fake flowers will still be around and won't be fading or wilting or withering or dying any time soon. These artificial flowers are also pretty low maintenance since one does need to water them or take care of them. In fact, you're pretty much settled already after just putting these flowers in a vase and displaying them somewhere in your house. Furthermore, there are some fake flowers that can look as beautiful as real flowers. And some have been made so exceptionally well that they might even be mistaken to be fresh and real flowers even though they're really not. In short, if you want to give a present that lasts for quite a while, then opt for artificial flowers instead of going for real ones. That is, unless your mother is a gardener and would like some real flowers for her garden. If that's the case, then it's definitely a good idea to get her some real flowers. So, you've decided to give your mom some artificial flowers for the aforementioned holiday. Awesome. Now what? The next step is trying to determine exactly what kind of fake flower you should get. Do you wonder if this even matters? Why can't you just give some random fake flower to your mom? Well, there's nothing wrong with that. Once again, it's your choice. But, why go with random flowers when you can put a bit more meaning to your gift and make it even just a bit more special for your mother? This is another way of showing just how much you love and care about your mom because you took the time and effort to get her special flowers instead of just grabbing the nearest random ones that you can find without even thinking about it. There are many different kinds of flowers out there and each of them have different meanings and symbolism associated with them. Don't just give your mom random flowers even if they might look very nice and pretty. Isn't it better to give flowers that have meanings and symbolism that can be associated with Mother's Day? What are some of the flowers that can be associated or that have meanings that are perfect for Mother's Day? Want to wish your mom much happiness in her life and marriage? Give her some peonies then. These flowers mean "happy life" and "happy marriage". With these flowers, you can let your mother know that you always want her to be happy no matter what. You can give her the message of living her life to the fullest and having a positive and cheery and optimistic outlook. 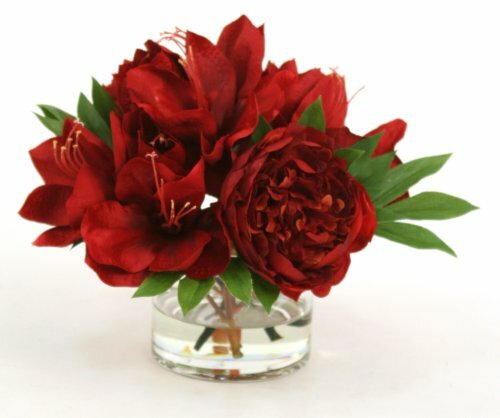 For a unique-looking gift, you can go with the peony flowers featured to the left. 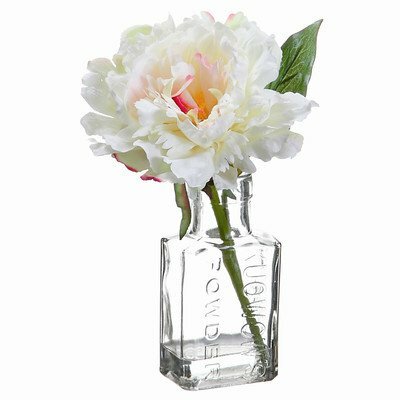 This particular peony is in a glass vase and this vase is one of the things that really makes this particular present unique. As you can see, this vase isn't like the kinds of vases that we usually see. Instead of pots and urns and the like, we get a vase that is shaped as a perfume bottle. The peony flower itself looks large and real and really appears to fit the vase it's been placed on. Carnations have several meanings that are perfect for the aforementioned holiday. It can mean "remembrance", which allows you to tell your mom that you will never forget her and that you can still remember all the sweet and lovely memories that you shared together as you bonded in the past. It can also mean "cheerful", which can let you tell your mother that you always want her to feel cheery and happy and that you never want to see her sad and that you want to see her smile light up her whole face. You can also say "wish I could be with you" with this flower. Yes, one possible meaning of carnation is that exact phrase. This is a very apt message to give to your mom if, for one reason or another, you won't be able to spend Mother's Day with her. Just remind her that, even if you can't be there with her right now, it doesn't mean that you've forgotten her and it doesn't mean that you love her any less. How amazing is it that you can say so many things with just one single flower? Look at the carnation featured above. 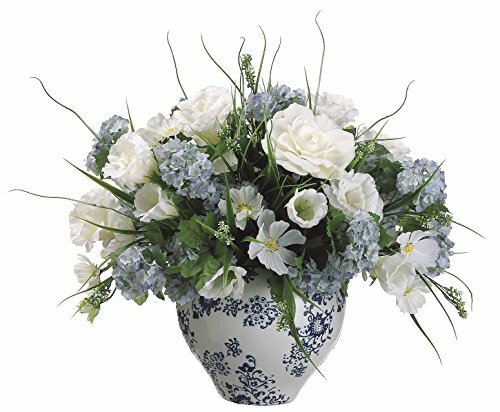 It looks so simple and even plain and yet, with that single pot and those flowers, you can already say so many things to your mom without having to utter a single word. Don't we all admire our parents? This can be for several and varying reasons like their strength of character, their personality, their accomplishments and achievements, and many more. 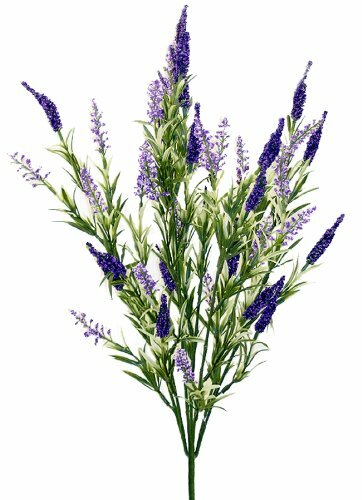 If you admire your mom, let her know by giving her some lavender heather. This flower, an example of which you can see to the left, means "admiration". Absolutely fitting for the ones you admire, right? Heathers aren't just colored lavender. There are also white-colored heathers like the one you can see to the right. Its meaning is "protection" and "wishes will come true". With this flower, you can tell your mom that you worry about her safety and you always want her to be careful and to take care of herself so that no harm will come to her. Aside from that, you can also relay the message that you believe in her and that you know that all her wishes will come true someday. You can also add that you are rooting for her and supporting her in all her wishes and endeavors so she mustn't give up and lose hope. Who doesn't want joy? If you wish someone joy, who wouldn't accept it? Gardenia means "joy". Wish your mother much joy and happiness, not just for Mother's Day, but for all other days of the year, by giving her some gardenias like the one you can see below. Just look at those silk plants (yes, they are fake and artificial flower but they look real, don't they?) and that ceramic pot. It looks beautiful and stunning, right, like it can bring joy to whoever looks at it? Well, if nothing else, it should at least bring a smile to someone's face especially if you're giving it as a gift. After all, who wouldn't smile and be pleased upon receiving a present? Like carnations, orchids also have several meanings that are apt for the holiday in question. Tell your mom that she's beautiful and that you find her gorgeous and lovely and fabulously magnificent since this flower means "beauty" and "beautiful lady". Did you know that red roses aren't the only flowers that mean love? That's right, orchids can mean love too. 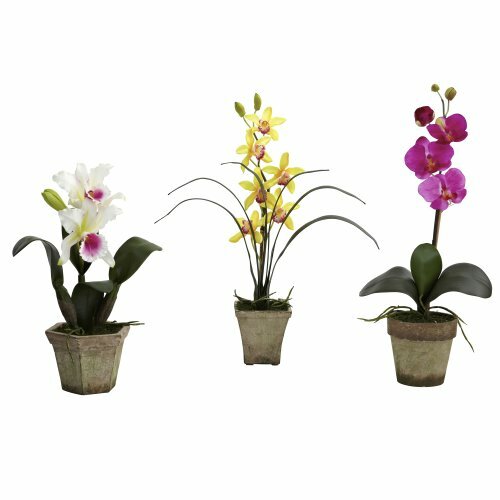 So if you want to say those three words to your mom, then you can do so by giving her some orchids like the one featured above. Who says you can't say "I love you" without red roses? 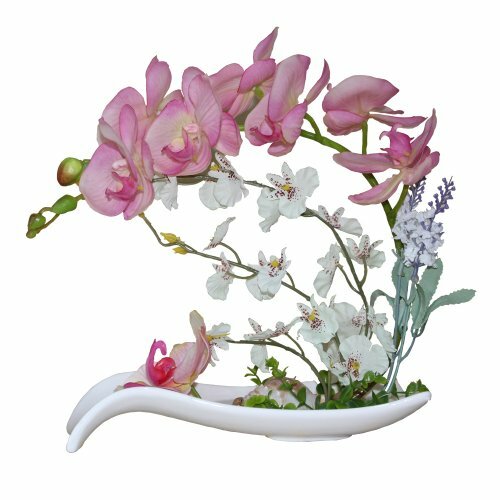 Just look at those orchids placed in such a unique-looking vase and in such an attention-drawing arrangement. It looks absolutely marvelous, no? There are many things that you can mean by saying this one word. You can say that your mom is always welcome to visit you in your house. You can say that she is always welcome to call you and talk to you and that she is always welcome to ask for help or aid. It can also mean that you're accepting her "thank you" and that you're saying that she is welcome. The wisteria flowers featured above make for a good floral decoration. 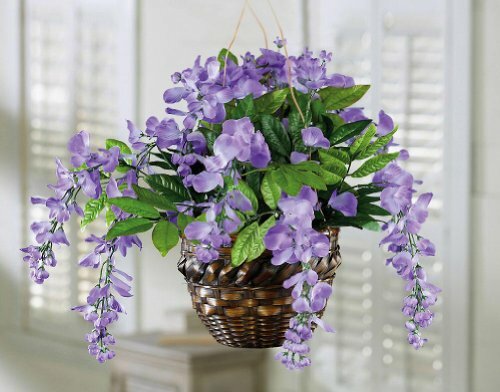 Your mom can hang the basket of wisterias anywhere inside her house and it can instantly add some vibrant color to what might otherwise have been a drab and dull-looking room. Best of all, since these are fake flowers, your mother doesn't have to do anything to maintain the magnificence of these blooms. The holly flower doesn't just mean happiness. It means "domestic happiness". If you want to wish your mom domestic happiness, then giving her some holly, like the one featured to the left, is one way to relay your message to her. The glass vase where this holly is placed has a cute and charming look to it. 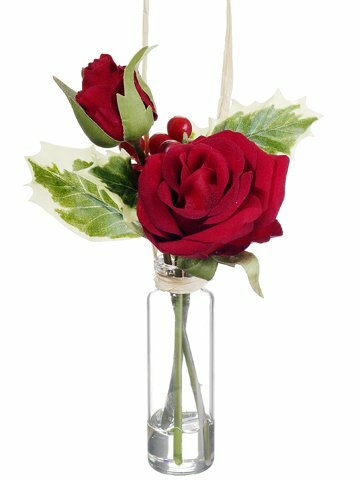 This particular product also includes roses alongside the holly so if your mom likes red roses too, then it can be a good idea to get her some as well. Sunflowers mean adoration, dedication and dedicated love. 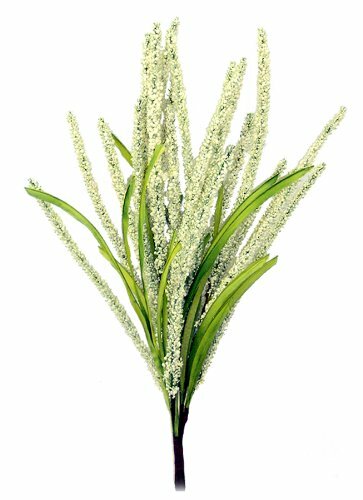 If you really want to give your mom some flowers for Mother's Day, you surely can't go wrong by choosing this one. With these flowers, you can easily tell her that you love her and adore her. You can even give her a dedication. 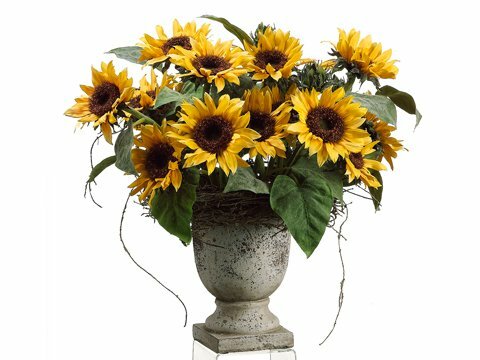 Aside from the appropriate meanings, these flowers look bright and light and sunny and cheery. Its yellow shade seems perfectly capable of relaying a message of happiness all on its own. Sunflowers exude warmth and they look utterly beautiful in their own right. Just look at the item featured below to see for yourself. The sunflowers may be fake but they certainly look real, don't they? And the vase looks so unique and original, to say the least, right? 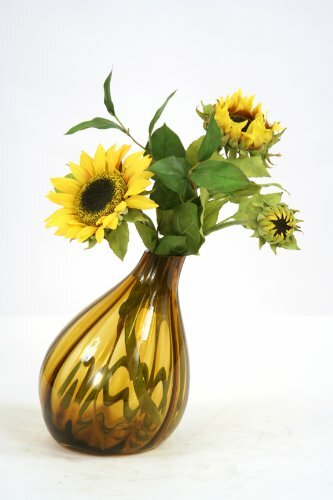 The sunflowers are in a "surrealistic-shaped amber gourd vase". Let your mom know just how much you care about her by giving her some pink tulips like the one shown to the right. 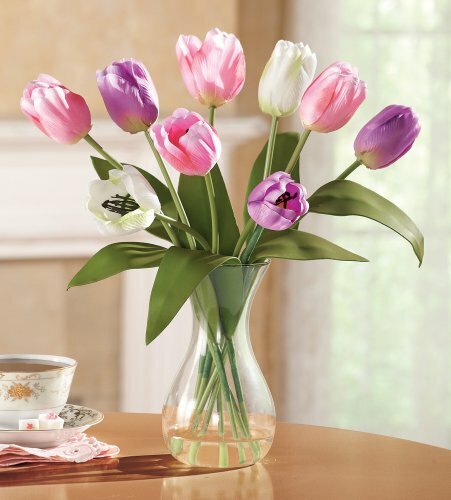 This particular item also includes purple and white tulips aside from the pink-colored ones. With these flowers, you can relay many different things to your mom like how you're concerned for her safety, how you want her to always be healthy, how you want her to be happy and successful, etc. And this is all because you care and you love her with all your heart. 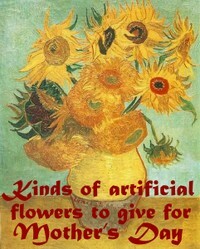 These are just some of the fake kinds of flowers that you can choose to give to your mom for Mother's Day. Each of these flowers have different meanings and symbolism that can be perfectly appropriate for the holiday in question. However, note that some of these flowers have other meanings besides the ones mentioned. The ones listed here are simply the ones that can be related to the holiday in question. Instead of giving your mom real and fresh bouquets or vases of flowers, give her some fake ones instead. Artificial flowers last and they don't wilt or wither or fade or die. Are you planning to give your mom some flowers for Mother's Day? Will you be giving her other presents aside from a bunch of flowers? 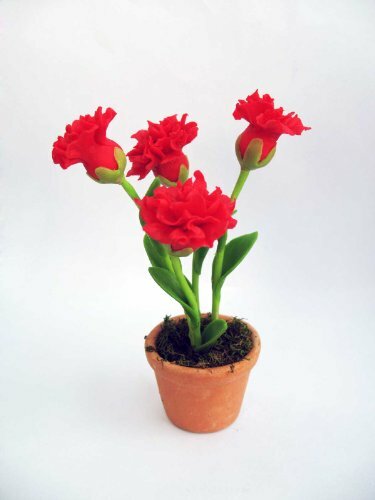 Which of these artificial flowers will you get for Mother's Day? Thanks for sharing your opinion. You're awesome. Hope your mom likes her present, whatever it may be. Have a great Mother's Day.